These ARE the best! I didn't change the recipe at all, and I don't see the need to. I didn't have any problems at all with the dough being sticky. Matter of fact, I used only very little flour to roll them out. It was the smoothest, most cooperative cookie dough I've ever worked with. I only chilled mine for 1 hour and worked with a quarter of the dough at a time. I keep the remaining dough in the refrigerator until I was ready to use it. 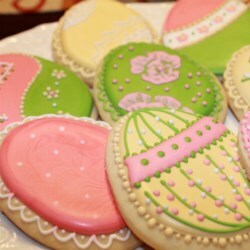 The cookies turned out soft and moist...WONDERFUL!!! !